Plain and simply, a non-toxic thermal pest control treatment works by raising the temperatures of an affected area to a level that is proven to kill the targeted pest(s).Clean, dry heat is directed into a contained area or structure through flexible Mylar ducting or portable electric heaters. The room air temperature is slowly raised to a safe "sauna-like temperature" that is lethal to the targeted organism. Temperatures in the range of 140-160ºF for about one hour prove fatal to many of the organisms that cohabitate our buildings. Temperatures accurately monitored and maintained at the the required temperature for anywhere from 1-12 hours, depending on the situation. For an alternative form of pest control that is safe and effective, choose the non toxic pest control method used to rid whole or partial structures of Bed Bugs, Drywood termites, and other unwanted pests. 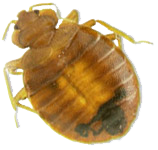 If you're looking for a natural pest control product, consider thermal pest control. Call AZEX Thermal Solutions at (877) 445-BUGS to learn more.